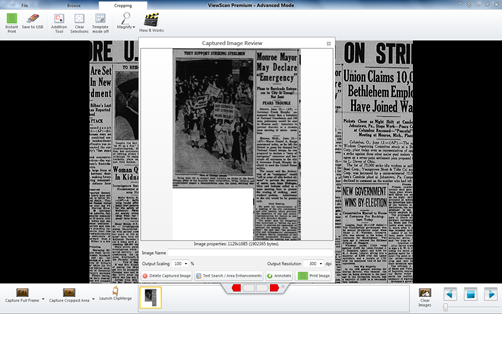 The Browse tab in the program lets the user adjust the image, much like the "wheel" in the lens of the older machines. However, inside this tab, the user has a higher degree of control over how much is "zoomed in" and how much is "focused." The user can also easily adjust light levels and even use the "Straighten" tool to level out the image! 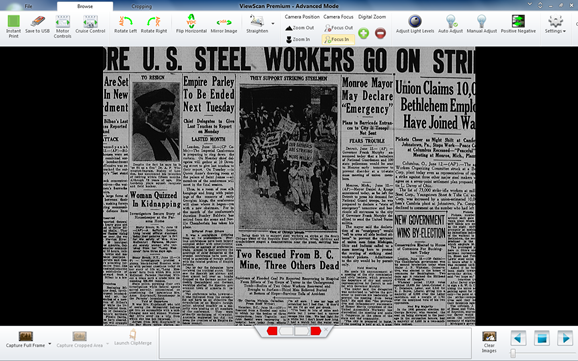 A screenshot of the "Browse" tab where users can adjust the image on screen. A screenshot of the "Cropping" tab where users can crop the image to capture only what they want. The images can be saved to a USB in various formats (PDF, JPEG, TIFF, etc.) 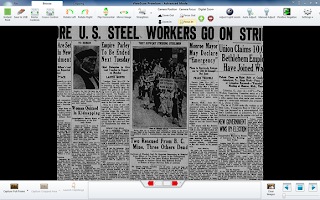 Most useful is the Searchable PDF option which uses OCR (Optical Character Recognition) software to create a PDF which is searchable using the "Find" functionality in Adobe. (Click and hold Ctrl + F on your keyboard to "search" a document that has OCR capability.) This will make locating important names, dates, or locations in your research that much more effective!